It seems that a lot of geeks also love bacon if they are not vegetarian. One of the few things I enjoy about waking up at 6 am for work is the fact that I get to cook Mrs. Uncommon Geek and I bacon and eggs for breakfast. The smell of cooking bacon mixed with the scent of freshly brewed coffee is enough to make being awake that early bearable. It tastes like heaven, but looks like bacon! Bacon is a subject that I’ve been wanting to write about for a while. 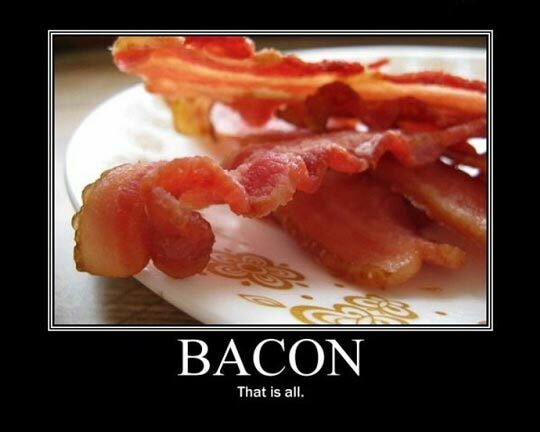 More specifically, bacon in geek culture. One thing that I found while researching bacon in geek culture is that bacon has taken over a lot of aspects of geek culture. There exists bacon scented body soap and air fresheners, as well as bacon flavored vodka, candies and more. While trying to pinpoint the exact instance of when bacon became a staple in the nerdosphere, I came to a great many dead ends. The only thing I was able to find is that sometime in late 2006 / early 2007, bacon seemed to appear on the nerd scene, quite honestly, over night. No one seemed to have a “this is when it happened” moment recorded. So, I gave up on that topic after almost a year of off-and-on research. Even though bacon appears to have remained a geek icon in and of itself, I have noticed a slight decline in the commercialization of this breakfast candy. Although, innovations in bacon science have not shown any signs of slowing down. At a con a few years ago, someone handed me a small strip of bacon. they told me to eat it, because I loved bacon. Paranoia began to set it, and I examined the bacon-like object. It was coated in sugar. I ate it, and it was one of the most disgusting things I have ever consumed. And that’s saying a lot. I was then told that it was candied bacon, and it was becoming a hit with other con goers. 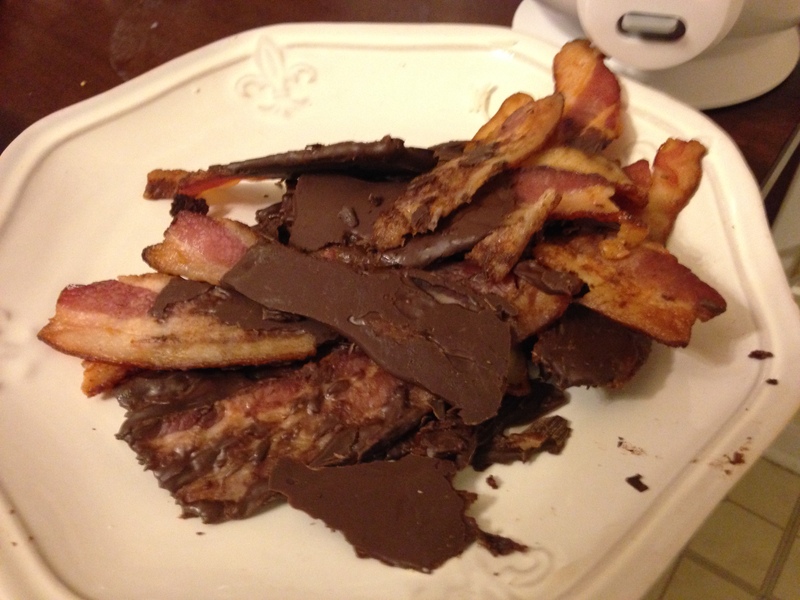 One of the more pleasant creations that bacon science has brought us is chocolate covered bacon. It was… different. That is the only way to describe it. The taste was a blend of sweet and salty. The texture was interesting, mainly due to the fact that it was thick cut bacon that had been refrigerated. 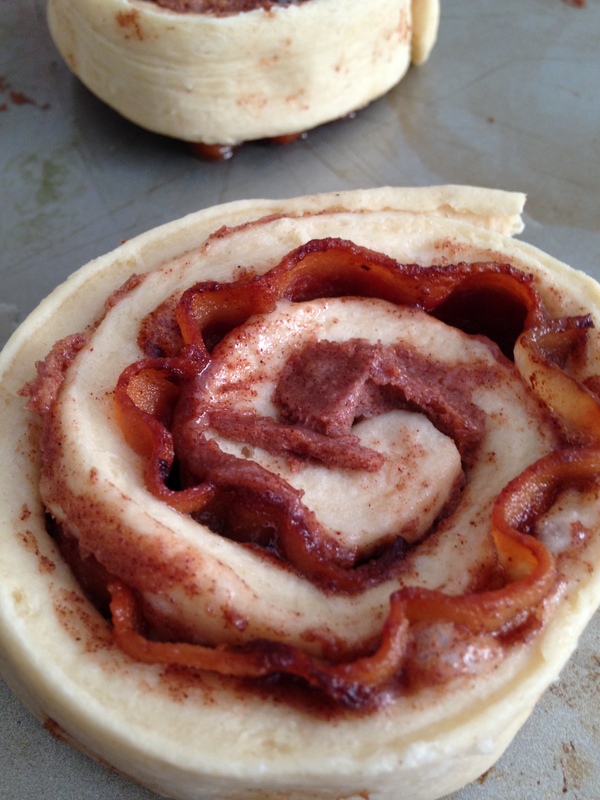 Cinnamon rolls with bacon in the middle before cooking. We’ve all seen the image of bacon cinnamon rolls on Facebook. We tried them here at Uncommon Geek HQ and it was actually very delicious! Easy to make, the main thing you need to remember is to slightly under cook the bacon so it can flex to be able to roll up and the bacon will finish cooking in the oven. That’s the most important tip in cooking these! Don’t try to wrap raw bacon in a cinnamon roll. Remember safety first in kitchen science! But, why do we love bacon, and why can we not get enough of it? I need to go make some bacon!